Governor Cuomo today held a winter storm briefing in NYC on how the powerful weather conditions are impacting the State, especially the Hudson Valley, NYC and LI regions. Suffolk County declares State of Emergency, blizzard warning for Suffolk and Nassau Counties, and whiteout conditions across Central and Eastern Long Island. New York, NY - February 9, 2017 - Governor Andrew M. Cuomo today held a winter storm briefing in New York City on how the powerful weather conditions are impacting the State, especially the Hudson Valley, New York City and Long Island regions. Suffolk County has declared a State of Emergency, and a Blizzard Warning is also in effect for Suffolk and Nassau Counties today through the evening commute. Video of Governor Cuomo's storm briefing at the Long Island Welcome Center. 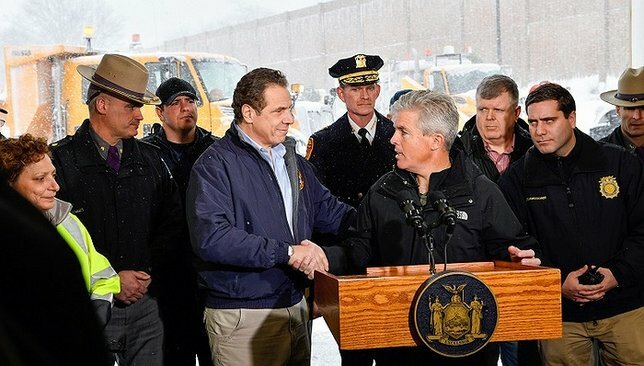 "The safety of all New Yorkers is priority number one, and as the snow intensifies throughout the day, we will continue to monitor the path and severity of the storm until it passes," Governor Cuomo said. "To ensure the safety of all New Yorkers, I urge everyone in impacted areas to stay informed, stay off the roads and remain indoors until the storm and blizzard warnings are lifted." Video of Governor Cuomo's storm briefing in New York City. There are accumulations of 10 to 16 inches of heavy wet snow expected, with the highest amounts in Suffolk County. Wind gusts could reach 40-50 mph on Long Island, which could down trees and power lines causing outages. Visibility will be one quarter mile or less from blowing and drifting snow throughout the day. In New York City, a winter storm warning remains in effect until 6 p.m. for Bronx, Kings, New York, Orange, Putnam, Queens, Richmond, Rockland and Westchester Counties. Within the NYC warning area, 10 to 14 inches of snow is expected. Capital Region and areas south have seen intense snow rates of up to four inches per hour and snow will last through the afternoon. Additionally, snow totals increased for the Hudson Valley to 7 – 12 inches. "The safety of all New Yorkers is priority number one... we will continue to monitor the path and severity of the storm until it passes," said Governor Andrew M. Cuomo. Variable Message Signs, Highway Advisory Radio and social media are being utilized to alert motorists of winter weather conditions on the Thruway. In addition, the following measures have been taken for downstate bridges. The Division of Homeland Security and Emergency Services Office of Emergency Management is also coordinating with state agencies and local governments to ensure resources are available throughout the storm. State Emergency Operations and Watch Centers will continue to be staffed for enhanced monitoring. To support roadway safety, one High Axle Vehicle has been staged at the Exit 52 Welcome Center on I-495 and another High Axle Vehicle has been staged in Westchester County. These vehicles are each equipped with blankets and hand tools, one eight-person tracked SUV, three enclosed, six-seat, tracked Utility Vehicles, and two, two-seat, tracked Utility Vehicles. Two additional High Axle Vehicles equipped with blankets and hand tools are being utilized by State Police for Long Island response operations. Additionally, the Brentwood & JFK Airport Stockpiles each have one Sandbagger and 195,000 sandbags, various generators, light towers and pumps are ready to deploy if necessary. Staff from State Office of Emergency Management, Department of Transportation, and State Police are working at the Nassau and Suffolk County Emergency Operations Centers, and State Office of Emergency Management staff are working in the New York City Emergency Management’s Emergency Operations Center. 45 patrols deployed during rush hour on Long Island. State Police stationed at Suffolk and Nassau EOC’s with additional staff available to assist at other county EOC’s as necessary. Metro-North and LIRR Cancelations: Metro-North Railroad has canceled five trains due to storm conditions. In addition, Long Island Rail Road crews continue to work around-the-clock at Jamaica Station following a derailment of one train 10-car at 4 a.m. on Wednesday, February 8. By Wednesday night, the disabled train was cleared from the station. However, two tracks remain out of service as inspections continue. As a result, nine trains are canceled. The LIRR is also experiencing system-wide delays averaging 20-30 minutes as a result of winter storm conditions. For more information on train service, click here. Metro-North and the LIRR have also deployed extra staff and specialized equipment to continuously monitor storm conditions, including up to 360 snowblowers, 35 pickup truck plows, and 7 rail-bound jets. Scheduled track work has been canceled to allow personnel to concentrate efforts on storm response. Anti-freeze trains have been deployed throughout the systems to spray de-icer on the third rail in an effort to prevent ice-build-up, and non-passenger patrol trains will operate along the right-of-way to prevent snowdrifts from forming on the tracks. At stations, extra personnel have been salting and working to clear platforms of snow throughout the storm. Waiting rooms will be kept open around the clock to provide shelter for customers waiting for trains. Bridges and Tunnels: Command Center has activated additional weather desks and monitoring conditions to ensure efficient deployment of personnel and resources. Electronic weather sensors are functional and all facilities have the ability to monitor weather and roadway conditions. There are more than 9,000 tons of roadway de-icer ready to be deployed and more than 100 pieces of storm fighting equipment including trucks and plows that have been actively clearing roads throughout the morning. Subways and Buses: New York City Transit continues to monitor conditions for subways and buses via its “Incident Command Center” situation room. There are 31 Snow Fighters in operation and an additional 19 Suburban’s are plow-equipped. Up to 2,900 snow-clearing personnel are on duty working 12-hour shifts. Snow-fighting equipment includes more than 1,000 snow melting devices at switches, about 1,500 3rd rail heaters, about 80 “scraper shoes” on trains, 10 snowthrowers, four jetblowers, and seven de-icer train cars. Bus tires are chained and a 20 percent reduction in local, limited and SBS bus service was in place during Thursday morning rush. Express subway service on A, B, E, D, F, N, Q, 2, 3, 4, 5, 6 will end early Thursday night and express service will be impacted later to facilitate underground storage of trains on express tracks. Previously planned subway maintenance, rehabilitation and construction projects (such as FASTRACK) will be canceled Thursday. JFK: 501 cancellations and airlines have taken down their domestic schedules until the afternoon. LGA: 655 cancellations and airlines report no planned activities until 2 p.m. with slow return service. EWR: 618 cancellations and United Airlines reporting they are increasing to full activity by 6 p.m. The Port Authority urges bus travelers to also check with their carriers before going to the bus terminals since many public and private carriers may cancel or delay service if conditions continue to worsen. In addition, all of the seaport terminals in the Port of New York and New Jersey are closed today. The Express Bus Lane into the Lincoln Tunnel is closed and the sidewalks over the George Washington Bridge are also closed. PATH service remains on schedule and there are no major issues reported at the Port Authority’s tunnels and bridges. Plow-equipped trains, liquid snow-melting agent trains and a "jet engine" plow to remove snow from PATH tracks, and snow blowers, plows and spreaders to clear station entrances, roads that serve PATH's 13 stations, and various support facilities. Tandem Trailers will be restricted on Interstate 84 due to heavy snowfall. Until 4 p.m. on Thursday, February 9, tandem trailers will be banned from Interstate 84 in both directions, from the Pennsylvania border to the Connecticut border. Tandem truck drivers who are planning to travel on I-84 are urged seek alternative routes or travel early. In addition, the New York State Thruway Authority has banned all tandem vehicles (long and short) on I-87 in both directions south of Exit 17 (Newburgh – Scranton – I-84 – NY Routes 17K & 300) until further notice. Subject: LongIsland.com - Your Name sent you Article details of "Governor Cuomo Issues Update on Winter Storm Response"